That would also result in higher prices for nuts, fruits, and vegetables, and possibly increased imports of cheaper fruits and vegetables from overseas countries where CCD is less prevalent. 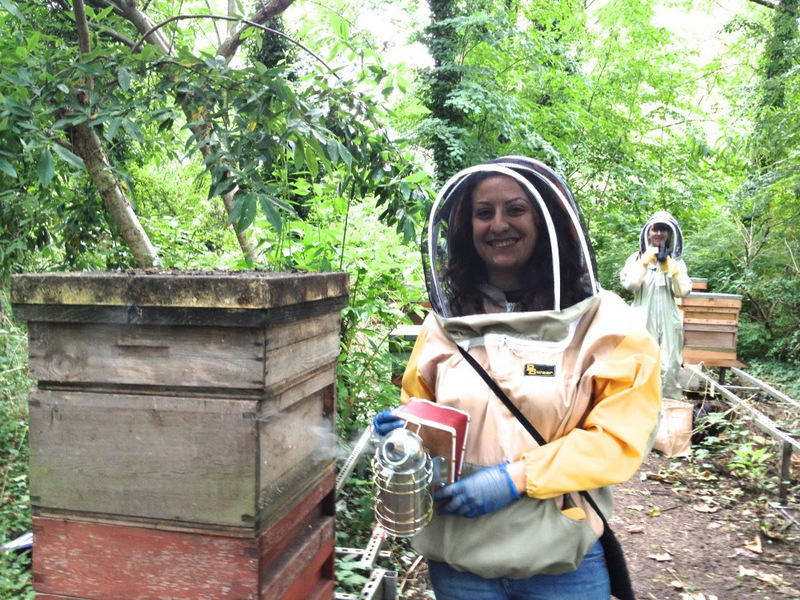 Several years ago McFarland and her husband, Rob, contributed $50,000 of their own money to create HoneyLove, a nonprofit group that teaches urbanites how to host bees in backyard hives. They and other experts present three workshops every month that show prospective beekeepers how to set up hives, attract a swarm, harvest the honey, and make candles and other products from beeswax. Rob says they don’t want to play down how involved beekeeping can be. “People generally get pretty wrapped up in the excitement that we call ‘bee fever,’ and we definitely want to encourage their passion,” he says. “But we are careful to explain that this is not the sort of hobby that you can take lightly. Mary Ann Frazier, a researcher at the Center for Pollinator Research at Pennsylvania State University, applauds the McFarlands’ work. One of those who caught the excitement via HoneyLove is artist Tia Tuenge, who first attended a HoneyLove workshop in 2007. “I never knew about this phenomenon called colony collapse disorder,” she says. In response, “I came home and tore out the grass in my front yard and planted a vegetable garden.” She also put in a fountain, and she’s planning on creating a bee-friendly landscape in her backyard. Matt Reed in Portland, Ore., caught “bee fever” in 2008 when he came home and found a struggling bee on a windowsill. He gave it some heated honey on a plate, which it devoured, and then it flew away. He thought that was awesome and told his wife as much. “She thought I was crazy,” he says. Four hours later, bees started showing up at their apartment. “The bee had communicated to other bees about the food source,” he says. A month later, he had his first beehive and began building more beehives and blogging about beekeeping. After people began e-mailing him to purchase hives, he created Bee Thinking, which provides beekeeping supplies, bee swarm removal services, beekeeping classes, and hive consultations. Back at the Venice High School Learning Garden, Chelsea quizzes her audience about the differences between honeybees and wasps. That is why bees are nature’s best pollinators, Chelsea says. Besides the pollen that they transfer from one flower to another – necessary to inseminate apple and almond trees, and most key crops – their fuzzy behinds also collect pesticide residues that create complex cocktails of chemicals over time. One thing that has made CCD so hard to study is that bees go away from the hive to die – there are no carcasses to study. And whatever CCD is it may only be contributory: It might not kill bees outright, but rather make them more susceptible to the stress of being trucked from farm to farm by commercial beekeepers, for example. “Why do beekeepers carry around that smoking teapot?” asks the little girl. Answer: The smoke calms the bees and refocuses their attention on eating honey. “It also disrupts their ability to communicate with each other using pheromones,” Chelsea explains. “The bees are sensitive to the CO2 in the beekeeper’s breath and can interpret that as a threat to the hive, like a honey badger or bear.” When the bees are calm, the beekeeper can more easily move around the hives to extract honey. Like the bees that sought out Mr. Reed’s apartment after learning there was honey there, more and more humans are seeking out HoneyLove. Last year HoneyLove financed its $80,000 budget with donations, grants, and dues from 465 members. Concern over CCD has gone global, Ms. Tuenge says. After protests across France in recent years over the use of pesticides, the European Commission adopted a proposal to restrict the use of three pesticides (clothianidin, imidacloprid, and thiamethoxam) for a period of two years. “This is just the kind of consciousness-raising HoneyLove is trying to achieve,” Tuenge says. • To learn more, visit http://honeylove.org.